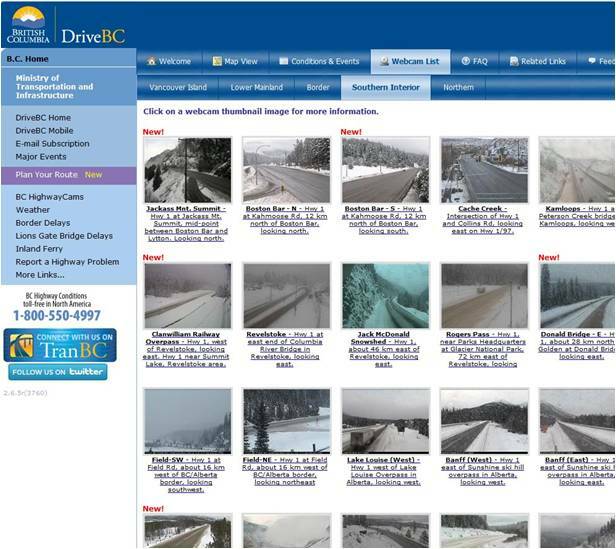 Based on the feedback you send us, you love our webcams, and you depend on them to be informed and travel safely throughout the province. Being so popular, our webcams are also the source for a lot of questions, and we’ve found a lot of people are asking about the same things. So we thought it’d be helpful to quickly cover some of our most common queries. 1. Can you put up more webcams? What is the benefit to the travelling public? 2. Why is the wrong image being shown? Some of our cams move around to cover different views. Occasionally this movement can cause them to be misaligned, and they need to be re-adjusted to make sure they’re pointed in the right place. These problems can often be solved remotely, but if there’s a mechanical failure, a technician will have to travel to the site to fix it. 3. How Do I use MyCams? MyCams is a useful feature that allows you to organize all the cams you want on a single page. It looks a little different, depending on whether you’re using the desktop or mobile version, but the function is the same. 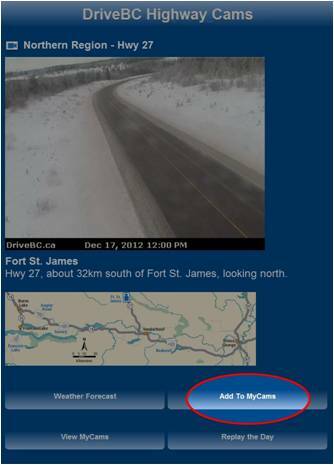 Look for the text or button that reads, “Add to My HighwayCams” (usually beside or below the webcam image) and click on it. 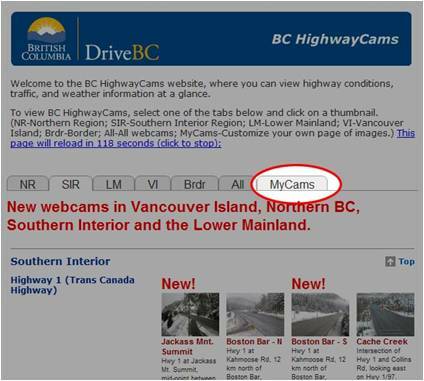 You’ll see the words change to, “Remove from My HighwayCams” to indicate the cam has been added to you MyCams page. To view your MyCams page. If you’re using the desktop version of the website, you then click on the MyCams tab (or the View MyCams button on mobile) to view your cameras. It’s important to mention the MyCams feature relies on cookies, which are small files downloaded automatically to your computer. If you have cookies disabled, or you delete them, your images won’t show. Also, when you choose cams for your MyCams page, you’ll only be able to view the choices on that that computer. So if you’re planning a road trip and want to take your MyCams with you, you should you make your list on your portable device (like your smart phone or tablet computer). 4. Are historical webcam images available? We get many requests for historical webcam images, but the webcam system is not designed as an image archive. 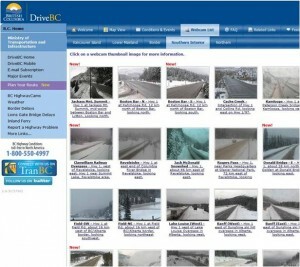 Our webcams take a picture every few minutes, and that image is electronically transferred to our webpage, with each new image overwriting the last. That said, we have recently made a Replay the Day option available, which we think is pretty cool (just look for the green button below the webcam image). 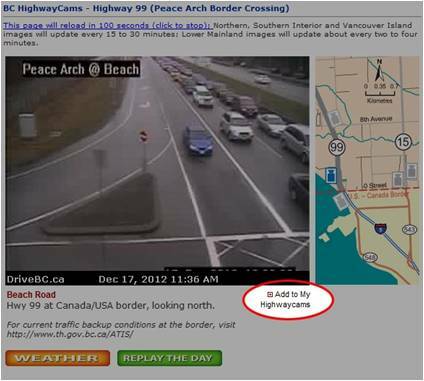 This feature collects images for a 24-hour period and lets users view them as a video. This is currently the only publicly available option for retrieving historical images. 5. Why do some cams go down more often than others? 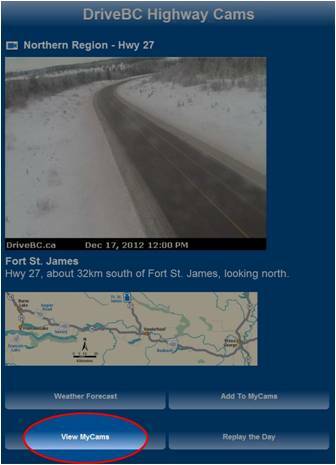 Many of our cams rely on hydro power and cellular signals, both of which can get disrupted when the winter storms come. Some cams, like the Cowichan cam, are more remote and rely on solar power, which brings its own challenges. For example, they don’t have the ability to run the internal heaters most of our cams have to keep lenses from icing or fogging in winter. Where we can’t use regular telephone lines or cellular signals, we rely on satellite signals, which are also affected by bad weather. If you’re curious to find out more about our webcams, we have a Frequently Asked Questions Page you can check out. Do you have other webcam questions that aren’t addressed here or our Frequently Asked Questions? Leave us a comment below, and we’ll find you the answer.